Ghana is well known for its traditional crafts, in particular the colourfully partterned kente cloth, which has been woven by Asante and Ewe people for hundreds of years. Dye-stanied adinkra cloth is also associated strongly with the Asante, who attribute different proverbs to each of 60 different Adinkra signs, and is often worn on funerals and other important occations. Hand-spun fugu cloth is a speciality in Bolgatanga and the village of Daboya, while wide straw hats and baskets are popular in the far north and east, and Sirigu in the north is an important centre of pottery. 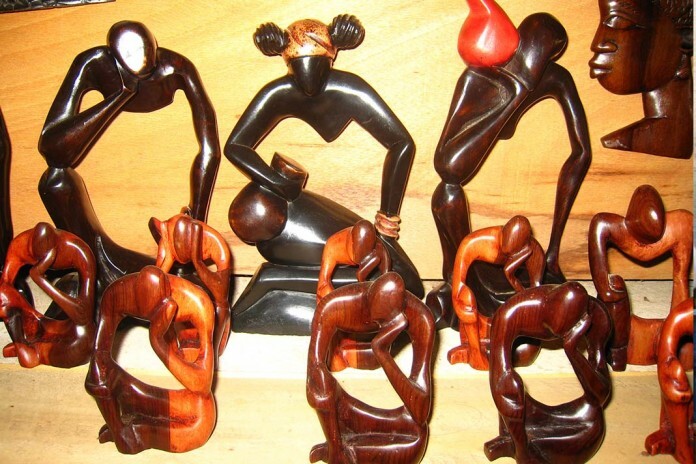 Craft stalls around the country also sell a wide selection of sculptures and masks made locally and in neighboring Mali, Togo, Benin and Cote d’Ivoire. Most hotels in Ghana exhibit arts and handicraft for purchase. Kente Cloth: In Ghana traditional weaving is done by men of the Ewe and Ashanti tribes. Who is more innovative depends on your source of information. The Ewe migrated from the north and their famous weaving villages are in the Volta Region along the path of migration. Ewe work is distinguished by animal, human and symbolic patterns woven into the cloth. The Ashanti are located in the Central Region and are known for their traditional crafts. Ashanti cloth is usually geometric in design. Both groups excel at weaving cloth fit for a king, and originally Kente was only worn by kings, chiefs or people in very prominent positions. Now, it is available to all, but because of its expense, it is still the cloth of prestige. Traditional pottery in Ghana is simple and functional. Glaze is not common and the color of the pot depends largely on the type of clay used, although some pots are black from the smoke created during firing. Pots are still used to prepare, cook, and store food. Perhaps the most functional is the grinding bowl which is shallow with ridges on the inside. Food is ground with a small wooden pestle. Pots are low fired, therefore fragile, but inexpensive and for sale in every market and often on the roadside. Traditionally pottery is made by women, but many men are contemporary potters with many design departures from the women’s pots. Something that was started as a special tribute to an uncle has turned into big business for some coffin makers in Teshie/Nungua, a suburb of Accra. These are coffins, although they can be considered sculptures, which are constructed in the shape of cars (usually Mercedes), planes, animals, etc. If you were a fisherman in life, you can be buried and transported to the next world in a fish. Because the cost starts around $1500 burial in one of these clever structures is limited to a small part of the population. Because of articles in the press, especially National Geographic, they have become collectors items in the western world. When you ask Ghanaians where beads come from they will tell you that they come from the ground, and indeed, many have been dug up, but the Krobo are the most famous beadmakers in Ghana and originally they bought their beads from traders who came from Nigeria. Now there are several Krobo workshops where glass beads are made in ceramic molds by firing in woodburning kilns. Made by men, it takes several years of apprenticeship to be able to form some of the intricate patterns associated with African beads.